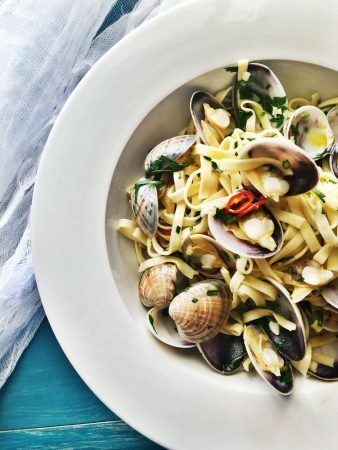 Vongole (or clams as we call them here in Australia) are a delectable little shell fish that can sometimes be overlooked on Australian menus. I say this because not a lot of people have tried them. 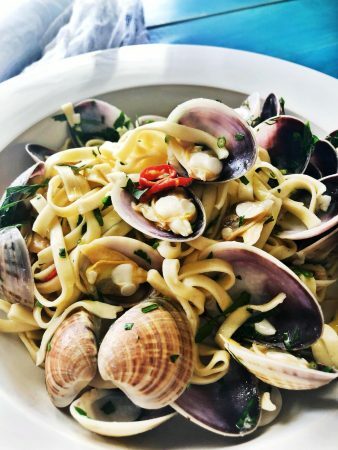 Many may have tried their slightly bigger cousin the pipi, however clams have a slightly more plump flesh and a sweetness that can only come with the beautiful ocean waters of WA. Clams are molluscs which also includes oysters, mussels, pipies, cockles, and scallops. They are part of the Bivalve family. The name ‘bivalve’ literally means ‘two valves’. The soft-bodied animals live inside the shell valves, which are joined together by a hinge and a flexible ligament. When the animal inside dies, the ligament usually breaks and the shells are found washed up on the beach. I often wondered about all those shells washed up at the beach! Now I know. Here in WA we have some of the finest clams in the country just up the coast in Shark Bay. The clams are plump, juicy and ever so fresh. Exactly what you would expect WA seafood to be. For me personally, seafood should taste and smell like the sea and it must be as fresh as possible. We sourced our clams from Kailis Bros in Leederville at their fish market … and they looked an absolute treat! 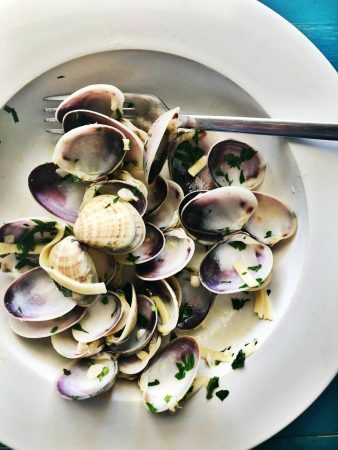 Looking at these clams, it reminded me of sitting by the seaside in Italy and at mezzogiorno, eating a rather generous helping of pasta con vongole at the local bagno trattoria. This is not an uncommon thing to do in Italy whilst at the beach. The freshness, the salty summer air and of course the sunshine all remind me of wonderful memories with family and friends alike. Seeing as we are a stone’s throw away from summer – and we have all this wonderful produce at our fingertips – Renee and I decided that this recipe should most definitely feature as a GR Club recipe. It’s fast, fresh and ever so delicious. We hope you enjoy this as much as we enjoyed making it. Never cooked with clams before? Don’t worry – they are super easy to cook and prepare … go on and try it out this weekend! Place all the clams in a large dish of cold water and soak for 30 minutes prior to cooking. This will allow any sand that they may have inside to be purged and remove any grit from the grooved shell. Drain and rinse again. While the water comes to the boil, peel and chop the garlic followed by the chilli and parsley and then set aside. Next, place a generous glug of extra virgin olive oil in a deep dish, frying pan or pot. Add the garlic and chilli and sauté until it has softened and slightly coloured. Take care not to burn the mixture! Now it's time to add the clams and agitate the pot or mix very well so that they are coated in the olive oil mixture. Now add the wine and cover with a lid – agitating the pot every so often. By this stage the pot of water should be boiling rapidly. Add the linguine and stir gently – this will only take literally 2 minutes. You want the linguine to be just under cooked as it will continue to cook in the pan with the vongole. Go back to your clams – they should all be open and swimming in the pan juices. Turn the flame off and keep them covered. Discard any clams that do not open as they might not be good for consumption. Using tongs, drag the pasta into the clam mixture - it's okay to use some of the pasta water as this will add a creaminess to the sauce. Add in an extra glug of extra virgin olive oil to the pasta and the vongole and toss very well. Lastly sprinkle with the chopped parsley and toss again. Taste and season with a bit of salt if needed. 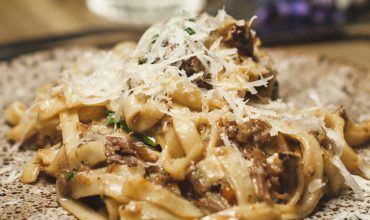 Serve immediately and drizzle some extra virgin olive oil for that extra bit of flavour and shine!